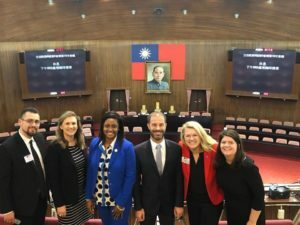 In late April, ACYPL sent a delegation of seven to Taiwan, including a Mississippi State Legislator, two staff members of statewide elected officials, and the Executive Director of the Association of Justice in Seattle, Washington. For this exchange, ACYPL worked with our longtime partner, the Taipei Economic and Cultural Representative Office (TECRO). The program began in Washington with a briefing by officers from the Taiwan desk at the US Department of State to provide delegates with information about the US position on sovereignty issues between Taiwan and China. The briefing was followed by a lunch meeting with the entire North American TECRO team at their Twin Oaks Estate, which foreshadowed the high level of respect and courtesies the delegation would encounter during their stay in Taiwan. After lunch, the delegation met with a scholar from The Brookings Institution who provided further context and history of the relationship between China and Taiwan to prepare the delegation for a topic of conversation they encountered regularly while in Taiwan. In addition to many informative political meetings the delegation covered in Taiwan, they also visited a Night Market, the National Palace Museum, and Taroko Natonal Park. Delegates on this exchange thoroughly enjoyed their experiences and ACYPL looks forward to its continued partnership with TECRO.